Chicken Cordon Bleu is one of my favorite foods ever. I make a lot of variations of it as well, which you will see in some upcoming posts, however for now I wanted to start with the original - basic Chicken Cordon Bleu. Many people may feel that Chicken Cordon Bleu is difficult to make, but with this recipe it is very easy and relatively quick. I love that it only takes a few minutes to prep before going in the oven for about 30 minutes giving you time to put together some side dishes to serve along with it. Place broth in a small microwave-safe bowl; microwave at high 15 seconds or until warm. Stir in butter and garlic. Combine breadcrumbs, Parmigiano-Reggiano, and paprika in a medium shallow bowl; set aside. Place each chicken breast half between 2 sheets of heavy-duty plastic wrap, and pound each to 1/4-inch thickness using a meat mallet or rolling pin. Sprinkle both sides of chicken with salt, Herbs de Provence, and pepper. Top each breast half with 1 slice of prosciutto and 1 tablespoon mozzarella. Roll up each breast half jelly-roll fashion. Dip each roll in chicken broth mixture; dredge in breadcrumb mixture. Place rolls, seam side down, in an 8-inch square baking dish coated with cooking spray. Bake at 350° for 28 minutes or until juices run clear and tops are golden. 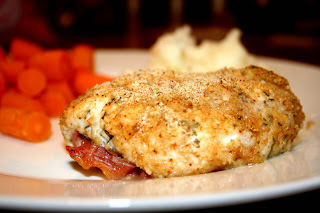 Chicken Cordon Bleu is one of my all-time favorites!